LIC Housing Finance has released the Recruitment notification for the posts Assistant/ Associate/ Assistant Manager. LIC Housing Finance Ltd (LICHFL) is one of the largest Housing Finance Companies in India with a key objective of providing long-term finance to individuals for the purchase or construction of house/flat for residential purposes in India. 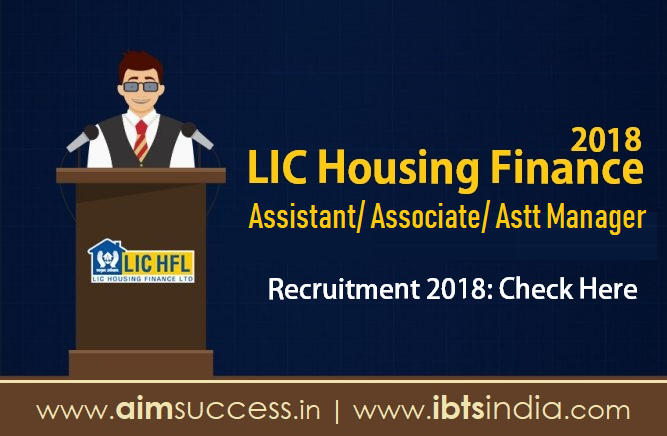 The Total Number of vacancies in LIC HFL 2018 are 300 in all posts ( Assistant/Associate/Assistant Manager). To avoid last minute rush, candidates are advised to pay the application fees and register online at the earliest. Note: In case of any query while filling up the online application form, payment of fee/intimation charges, etc., the applicant may send the query at http://cgrs.ibps.in/ Kindly mention ‘LICHFL – Recruitment 2018’ in the subject of the query. The online examination will be separate for Assistant, Associate and Assistant Manager. It will be in English language only. There will be penalty for wrong answers in the online examination. For every wrong answer to a question given by the candidate, one fourth or 0.25 of the marks assigned to that question will be deducted as penalty to arrive at corrected score. If a question is left blank, i.e. no answer is given by the candidate; there will be no penalty for that question. LIC HFL reserves the right to fix the minimum cut- off marks, section wise as well as on total in the online examination in order to finalize the number of candidates to be called for the Interview. The corrected scores obtained by each of the candidates in different sessions (if held) will be normalized using equipercentile method. Decision of the Company in this regard shall be final and binding on the candidates. No correspondence will be entertained in this regard. Depending upon the number of vacancies, only those candidates who rank sufficiently high in the order of merit based on their respective Marks in Online Examination for Assistant/Associate/Assistant Manager will be called for interview. Candidates who do not obtain the minimum qualifying marks in the Interview shall be disqualified from further selection. Shortlisting of candidates for interview will be provisional without verification of documents. Candidature will be subject to verification of all details/documents with the original when a candidate reports for interview (if called). In case a candidate is called for interview and is found not satisfying the eligibility criteria (Age, Educational Qualification, etc.) he/she will not be allowed to appear for the interview. The final merit list and selection of candidates will be separate for each post of Assistant, Associate & Assistant Manager and will be done on the basis of combined marks of Online Examination and Interview strictly according to the merit ranking, subject to minimum qualifying marks in the Interview. The Company reserves the right to change the selection procedure, if necessary. Selected candidate will have to undergo Medical Examination and will be appointed as Assistant/Associate/Assistant Manager subject to him/her being found medically fit by the Medical Examiner authorized by LIC HFL for this purpose. Two years full time MBA/ Two years full time MMS/ Two years full time PGDBA/ PGDBM/PGPM/PGDM in any discipline from a recognized university/ institute/ board (minimum aggregate 60% marks). Course completed through correspondence/part-time are not eligible. Age Limit (as on 01.01.2018): Not below 21 years and not above 28 years as on 01.01.2018 i.e. candidates must have been born not earlier than 02.01.1990 and not later than 01.01.1997 (both dates inclusive). All the educational qualifications mentioned should be from a University/ Institute/Board recognised by Govt. of India/approved by Govt. Regulatory Bodies and the final result should have been declared on or before 01.2018. Proper document from Board/University for having declared the result on or before 01.01.2018 has to be submitted at the time of interview. The date of passing the eligibility examination will be the date appearing on the mark- sheet or provisional certificate issued by University/Institute. In case the result of a particular examination is posted on the website of the University/Institute and web based certificate is issued then proper document/certificate in original issued and signed by the appropriate authority of the University/Instituteindicating the date of passing properly mentioned thereon will be reckoned for verification and further process. Candidate should indicate the percentage obtained in Graduation/Post- graduation calculated to the nearest two decimals in the online application. Where CGPA/OGPA is awarded, the same should be converted into percentage and indicated in online application. If called for interview, the candidate will have to produce a certificate issued by the appropriate authority inter alia stating the norms of the University regarding conversion of grade into percentage and the percentage of marks scored by the candidate in terms of norms. The Centre, venue address, date and time for online examination shall be intimated in the respective Call Letter. An eligible candidate should download his/her call letter from the LIC HFL’s website www.lichousing.com by entering his/ her details i.e. Registration Number/Roll Number and Password/Date of Birth tentatively from 24.09.2018 onwards. No hard copy of the call letter/ Information Handout etc. will be sent by post/ courier. Intimations will be sent by email/sms to the email ID and mobile number registered in the online application form. Company will not take responsibility for late receipt / non-receipt of any communication e-mailed/ sent via sms to the candidate due to change in the mobile number, email address, technical fault or otherwise beyond the control of Company. Candidates are hence advised to regularly keep in touch with the LIC HFL website (www.lichousing.com) for details, updates and any information which may be posted for further guidance as well as to check their registered e-mail account from time to time during the recruitment process. Candidate should affix recent recognizable photograph on the call letter preferably the same as provided (uploaded) during registration. Candidate should ensure that copies of the same are retained for use at various stages of the process. Candidates are also advised not to change their appearance till the process is completed. Failure to produce the same photograph at various stages of the process/ doubt about identity at any stage could lead to disqualification. Candidate must appear at the online examination centre with (i) Call Letter (ii) Photo Identity Proof as stipulated in the call letter and photocopy of the same Photo Identity Proof as brought in original. In case identity is in doubt, candidates will not be allowed to appear for the online examination.